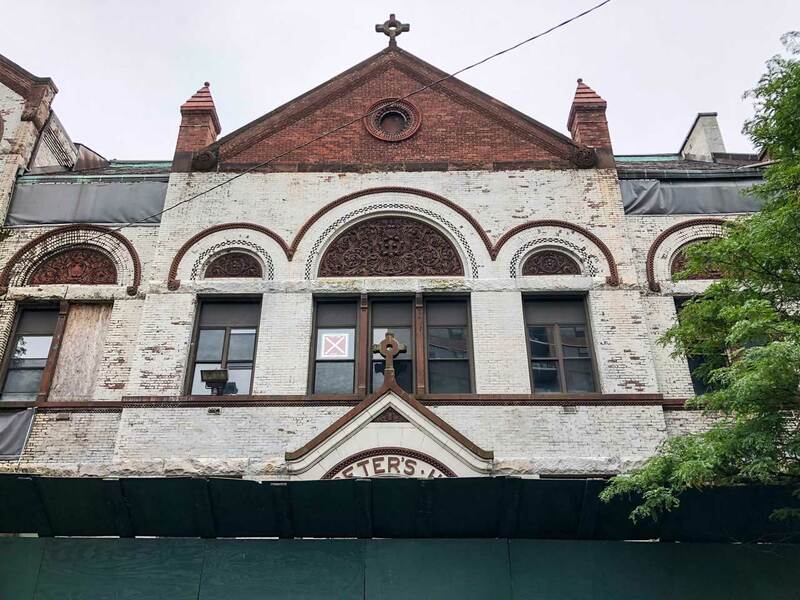 Part of the old Saint Peter’s Grammar School has stood at the corner of York and Van Vorst Streets in Downtown Jersey City since the beginning of the Civil War, but the end could soon be near for this historic complex. 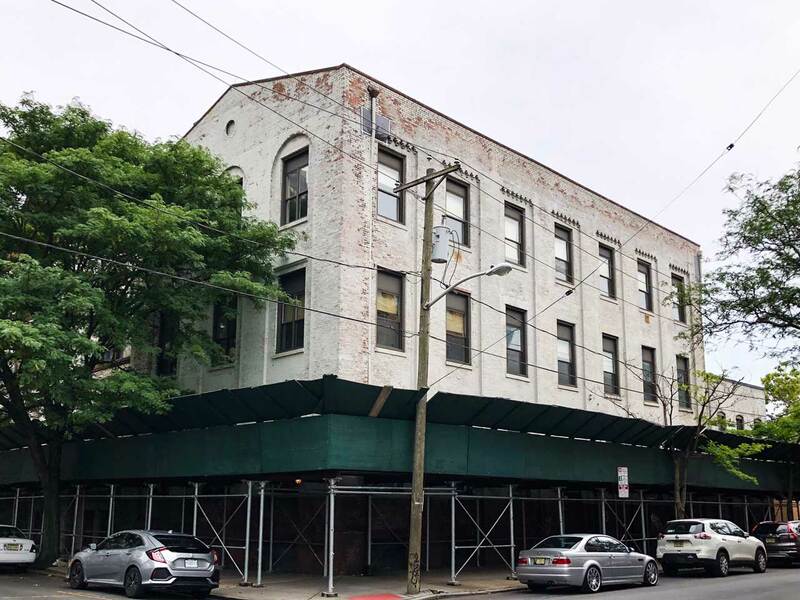 Saint Peter’s Preparatory School, which owns the property at 137-55 York Street, has applied to the Jersey City Historic Preservation Commission (HPC) for a certificate of appropriateness in order to demolish the structure. The Romanesque Revival edifice includes the three-story St. Peter’s Hall, which dates back to around 1894. It is attached to the original school building from around 1861, according to an agenda from the HPC. The building, which sits within the Paulus Hook Historic District, was home to the Liberty Academy Charter School at the beginning of the 21st century. New Jersey City University’s Jersey City Past and Present database states that St. Peter’s Prep then bought the site in 2005 from the Archdiocese of Newark. Recently, the building has sat vacant while the facade, including the inscription reading “St. Peter’s Hall,” has been partially covered by scaffolding. However, the school and hall have a long history in this Ward E neighborhood. In fact, three years before he became the president of the United States, Woodrow Wilson, who was the president of Princeton University at the time, came to St. Peter’s Hall to deliver his first campaign speech of the general election while running to become New Jersey’s governor. On September 28, 1910, Wilson spoke in the building before a “rough and tumble audience” and stated that “now I find myself in the novel position of asking you to vote for me for Governor of New Jersey,” according to a book about the president by John Dos Passos. Over 100 years later, the HPC was initially scheduled to hear the plans for tearing the building down on May 21 and July 16, but St. Peter’s Prep requested that the matter be moved to the meeting on August 20. The preparatory school’s plans for the site are not listed in the meeting agenda. Sheeesh…we have no sense of history…why can’t they refurbish, instead of wreck?? Prep does not want to be bothered restoring it. It is easier to sell the property and knock it down. How can this be on the chopping block and ugly pieces of crap get thrown up everywhere? If the HPC passes this application and this building goes down, then the whole lot of them need to be relieved of their positions. What part about ‘historic’ did they miss? Jeez! They should leave it as it is. It is a beautiful, old building. Very, very sad if it gets approved. In the 1960’s, my mother cleaned the school. If it gets torn down, she’ll be rolling in her grave. working class rough and tough people once filled the hall. sign of the times. gentrification does not include the people who once stood in those halls. they will probably knock it down and put another cookie cutter apartment building, instead of keeping a beautiful old building. sad. I attended Saint Peter’s grammar school as well as my grandmother and great grandparents and my great great grandfathers name is on the corner stone. This makes me so sad. They neglected this building over 20 years ago when the nuns ran it and no one to take care of the building . I started a petition to save it – I called the state to declare it a historic building, which they did. Developers are drooling over this. Bye Jersey City your gross. No character just boxes of buildings. No history just prime real estate. I am so happy I moved. The school was built by Carpenter John Geraghty. He is my great great grandfather- it was built by Irish Catholics. Please email me at [email protected]. I called you last summer and no one responded. As for historic designation, what do you mean? This was Built by blood sweat and tears of the working class who built and lived in Paulus Hook. This was built around or before 1880. This was built so people could send their children to school within a close proximity to where they live. I have no idea when I called your Jersey City Landmarks Conservancy a million times and no one responded but it is now at the attention of a publication and you do. Also in the 1970’s and 1980s, and well into the 1990s, this was a satellite school for Spanish speaking children. Our reading books wherein Spanish and English. This is the time I attended. This was a wonderful time and the Spanish from Central, Carribean, South American as well as a strong Philapino population kept the church and school alive and thriving. Also this school was Saint Peter’s grammar school for over 100 years. It was Liberty Charter School for like 1 year. I attended Saint Peter’s as well as my grandmother,great grandparents and my great great grandfathers name is on the cornerstone as one of the builders. This makes me extremely sad that they are tearing this down and not setting up a fundraiser to restore it. I called to have it declared an historic building. I started an online petition and Prep did want to hear a thing. The building was neglected years ago when the nuns ran the school without proper maintenance. Very sad. Jersey City is so gross now. Loss of character. Cookie cutter condos. They tore down the old bathhouses downtown jersey city in the 1960’s, with portions of that building going back to the 1660s. The razed most of downtown where we were raised to make room for more New Yorkers and illegals. What’s next? Raze City Hall? also, didn’t the old church get razed because when it was built, Almost All of downtown was marshland, and could not support the building so it was sinking into the mire? Thanks for posting this Diedre. It makes me so sad knowing what this meant to our family. I guess it is not important to keep these symbols of the past built with pride and dedication to the value of Catholic education. Ruthanne, they decommissioned the church I was baptized in and made my communion in and now this? I am so upset! I am willing to fundraise to at least have the building restored to its beautiful original design- the church should keep it a school and restore it. The Jovohah Witness restore old buildings why cannot the Catholics. This is so upsetting and as well to the new people who bought in the neighborhood. Yes, I am a relative newcomer (I’ve been in JC about eight years), but I treasure this building. I always look up at those beautiful sculpted half-roundels (made of terra cotta?) above the windows every time I walk by. It’s a shame it’s beem obscure by scaffolding recently. It’s one thing to build skyrises on empty land or former parking lots, but it’s very different to tear down a historic building in a neighborhood JC considers its historic district. These buildings represent the character and history of Jersey City that longtimers and newcomers love. Deirdre, what can be done? Will the Historic Preservation Committee entertain comments from the public? I’ll do whatever I can to help. I feel the tax abated buildings should contribute to restoring this building to its pristine original architectural design. As well as continue to be a center for Catholic education and center for the community. If you get abatements you should get donating! I was, am, and will be forever grateful for My Grammar School education at St. Peter’s Grammar School 1958-1966. I lived in 163 York St.
My early life was filled 24/7 with the Society of Jesus and the Wonderful Sisters of Charity. I just want to say most sincerely Thank You to every single Priest and Sister and the lay teachers during my years. I become very emotional remembering My Grammar School years of a wonderful life with a very solid , very disciplined education for which I am so very thankful for. May God ,Our Father, hold so dearly Our Priests and Nuns and all students in His protective arms. I love and thank everyone who taught me and attended class with Me. May God bless St. Peter’s graduates 🎓 of all time, and I’ll continually pray for our proud community.